Home Expert Advice Ingredient Dictionary CBD Oil's Benefits for Skin: Can it Help With Acne, Anti-Aging, & Other Skin Issues? CBD Oil's Benefits for Skin: Can it Help With Acne, Anti-Aging, & Other Skin Issues? 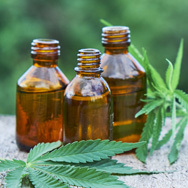 CBD (also known as cannabidiol) oil is the non-psychotropic component of marijuana that has become well-known for relieving aches and pains when applied topically. More recently it is being marketed in skin care products for everything from acne to wrinkles. But is any of that possible, or is it just marketing hype? These are the facts you need to know. First things first: CBD oil won’t get you high because it doesn’t have the mind-altering properties of marijuana’s tetrahydrocannabinol (THC) content. CBD and THC are sourced from two different parts of the marijuana plant. It is also important to know that CBD oil is not the same thing as hemp oil. The two are often marketed interchangeably, but CBD oil is richly concentrated in cannabidiol, whereas hemp oil only contains trace amounts of cannabidiol. To be certain that you’re buying CBD oil, look for cannabidiol or cannabis sativa seed oil on the ingredient label. What’s clear from numerous studies is that CBD oil functions as an anti-inflammatory. So how does that translate to skin care? One way is its ability to help calm skin, particularly skin that’s acne-prone. Because acne is an inflammatory condition, research indicates CBD’s soothing properties can help diminish breakouts and reduce redness. Surprisingly, recent findings also show that CBD has the potential to decrease excessive sebum (oil) production, as well as help offset other triggers of acne. Without question, far more conclusive, scientific studies are needed, but CBD’s potential as an alternative acne solution is exciting. In the meantime, you can read up on other acne treatments with definitive research supporting them. It turns out CBD oil also has antioxidant properties which contribute to the research indicating CBD oil can help lessen the visible signs of aging skin. By reducing inflammation and counteracting free-radical damage, CBD anti-aging creams may be able to help visibly diminish issues like wrinkles, skin dullness, and ruddy skin tone. Of course, there are plenty of other antioxidants out there that can make the same claims so CBD isn’t the only or “best” antioxidant to seek out; rather, it’s just one of many to consider (learn more about our favorite research-backed antioxidants). Another significant benefit of CBD oil is that it has been found to soothe sensitive skin, and studies indicate that it may even be able to help inhibit certain triggers of disorders like psoriasis and improve eczema-prone skin. Again, far more research is needed, but what exists certainly looks promising, and researchers speculate it all comes down to CBD’s substantial skin-calming and skin-normalizing effects. But Is CBD Oil Even Legal? Here’s the confusing part: The legality of CBD-based cosmetic products in the U.S. and around the world is murky at best and open to differing interpretations because regulations differ from state-to-state and by country. Nevertheless, we’re seeing more and more beauty products claiming to contain CBD sold worldwide. The bottom line: As long as it’s extracted within the proper parameters, CBD oil does have benefits for skin. We’ll be following the research and the regulations closely, and we’re excited to see how the research behind CBD oil’s topical benefits continues to grow.